In the wake of 9/11, and with ongoing wars and tensions in the Middle East, questioning contemporary connections between and among religion, identity, and global governance is an exercise that is both important and timely. This volume, edited by Patrick James, addresses essential themes in international relations today, asking how we can establish when religious identity is a relevant factor in explaining or understanding politics, when and how religion can be applied to advance positive, peace-oriented agendas in global governance, and how governments can reconsider their foreign and domestic policies in light of religious resurgence around the world. 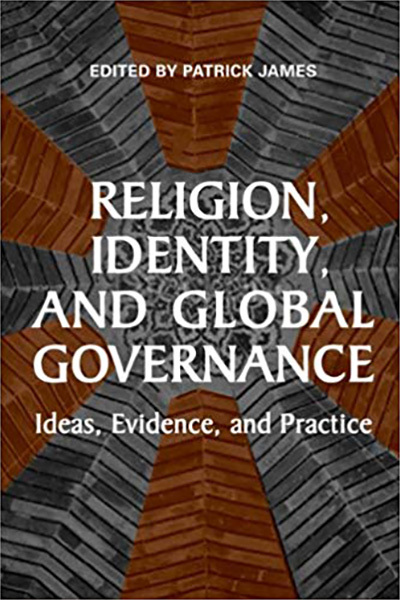 Religion, Identity, and Global Governance features a chapter by IGE President Chris Seiple, "From Ideology to Identity: Building a Foundation for Communities of the Willing." To understand international relations today, we must take into account the issue of religion. Religion, Identity, and Global Governance effectively defines the most important questions regarding global politics and religion and presents a variety of answers that will provide much fodder for discussion. Instantly interesting from the first few pages onward, the chapters build nicely and speak to each other while providing readers with lots to chew on.